All permit applications may be submitted at the Permit Processing counter. The counter is open from 7:30 a.m. to 5:30 p.m., Monday through Thursday and from 8:00 a.m. to 5:00 p.m. on Fridays. Please call our information line at 949-724-6313 to arrange for an appointment. Please call at least 24 hours in advance. Our Permit Processing staff assures that all applications are complete and reviewed by appropriate staff. Planning Section approval is required for building permits. The Code Coordination Office maintains contact with the applicant regarding project status and assessment of final fees. Upon final approval of an application, the Permit Processing staff verifies that all information is current and correct, collects all required outstanding fees, and issues the appropriate permits. Special queue for Homeowners. To simplify and expedite your visit to the City a special queue is dedicated to handling homeowner projects. Many simple projects may be permitted over the counter and some projects may be permitted via the mail. The City of Irvine offers a mail-in permit program that applies to residential work of a limited nature: replacement or installation of water heaters; minor plumbing and mechanical projects; and re-roof projects. Mail-in permits are available to contractors who have an active Contractors' License with the Contractor's State License Board and an active City of Irvine Business License. Homeowners performing their own improvements are also eligible. Permits can be obtained by mail if mail-in permit submittal requirements are met. An application packet including submittal requirements and forms for mail-in permits and the Business License Application Form are available for your convenience. Inspections for installation of small appliances (i.e., water heaters and fixtures; heating and cooling appliance replacements and residential re-roofing are performed by City Inspectors. A receptionist is available to assist homeowners to this special queue. Determine whether your project requires a permit. Self-service re-submittal system. For more information, please visit the self-service area located in the Community Development reception area or call the Permit Processing Information Line at 949-724-6470. For more information on submittal documentation, please contact the Permit Processing Information Line at 949-724-6313. Plan check fees and deposits are payable at time of submittal. 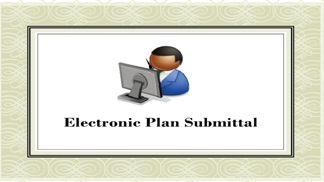 Plan check fees can be calculated prior to submittal via fax request to 949-724-6420. 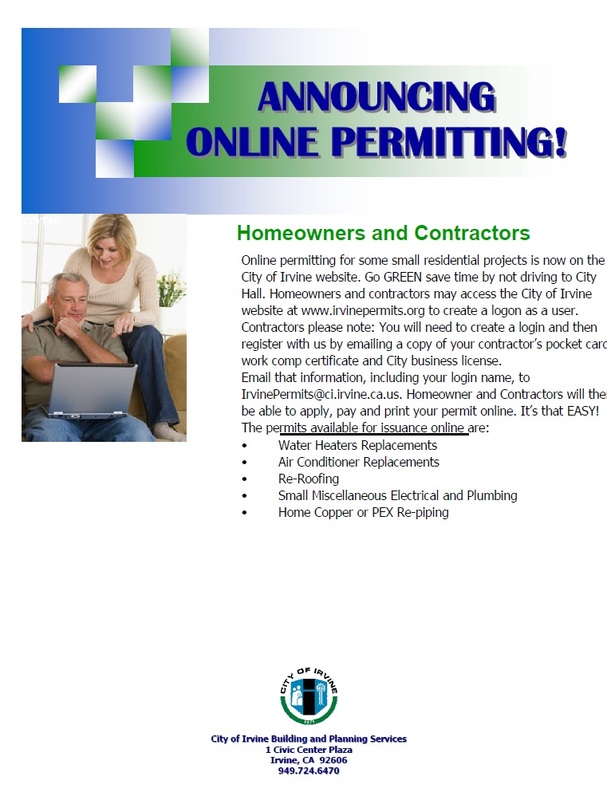 The City of Irvine Building & Safety Division is pleased to announce a program that allows contractors to obtain small residential permits online. For information on the types of residential permits that are now available to you on line, please click this link: irvinepermits.org/ApplyInstructions.htm. Save time by eliminating the need to visit City Hall to obtain a building permit. You will also save $16.00 per permit by applying online. We will still need to validate your contractor information (license, work comp insurance and City business license) and you will need to register as a new user. Please go to irvinepermits.org or call 949-724-6313 for more information. The Environmental Protection Agency has issued a rule, effective April 22, 2010, that requires contractors, property managers and others who disturb known or presumed lead-based paint to be certified. This is called Lead-Based Renovation, Repair and Painting Program or RRP. Generally, the rule applies to any work that disturbs painted surfaces in residential houses, apartments and child-occupied facilities like schools and daycare centers built before 1978. There are heavy fines for violating the RRP Rule. Please go to EPA’s web site for further information.